"Ever since Pearl Harbor our country has been asking, 'Where is our Navy? Why don't they fight?'" Wing and a Prayer tells the story of Naval men who, shortly after the Japanese sneak attack at Pearl Harbor, were asked to basically sail near Japanese military ports and act as if they were afraid of any direct conflict. The idea was generally to lure the Japanese Navy into thinking that the U.S. had been so adversely effected by Pearl Harbor, that they could easily move onto Midway Island, then take over further stations. Once lured there, the U.S. Navy had hoped to spring a surprise attack that would decide the Pacific war. Unfortunately for the men of "Carrier X," as it is referred to in the film, this meant their role was essentially to run from battle, not the most honorable mission for fellows who had just been badly burned by a severe sneak attack. The chronicle of the frustration and problems caused by this controversial course of action are the central focus of Wing and a Prayer. 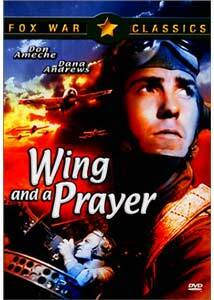 The story of a division of bomber/fighters is told through their own eyes who must not only behave in a way that contradicts their nature, but must also deal with a rather cold and harsh commander, played well by Don Ameche. Personality conflicts, on top of the basic issues they're having trying to act as they're supposed to, cause the men's exasperation to grow. Almost each member of the fighter wing is given a distinct personality; from a Hollywood actor turned pilot to a guy obsessed with growing fresh vegetables on board the ship. Since time is spent on each man, they grow a distinct identity, making it harder to see them suffer or, sadly, die because of the mission. The film is not just a story about the decoy mission, though; it also offers a look at the actual battle of Midway Island, where the Japanese fleet was ambushed by the U.S. Navy, who were ready to fight and show their actual purpose for a war-weary country. Filming technique must be mentioned because without the creative and tight blend of studio footage with stock footage, none of this would be very convincing. Instead, Wing and a Prayer has some of the finest aerial action sequences perhaps seen in any motion picture of that age. It would seem the filmmakers actually designed many scenes specifically around the stock footage to make it just that much more believable. There's plenty of special effects and trick photography, to be sure, but it shows a level of detail and crafting that I found astounding. There's very little to complain about in a war drama of this caliber, but there a few minor problem spots. Firstly, a few of the characters are designed as much-too-obvious tragedies. The story sets up ridiculous amounts of irony for certain pilots, and as a result, you know what's going to happen to some of them long before it actually does. Secondly, the film exaggerates "American might," just a bit. While the mission documented here was important, the battle of Midway was largely a gamble taken by the U.S. because it had to, not really because we were calculating a brilliant victory plan. The Japanese Navy was more than capable of virtually plowing through any offense we offered, but they lost because of some extremely poor tactical decisions, not so much because we out-smarted them. Regardless of the details, though, Wing and a Prayer is one of those tributes to various, unsung heroes in the campaigns of World War II, and it delivers what it promises with a lot of dignity and superb technical achievements. Image Transfer Review: The black & white picture is of very satisfying quality, with good detail in both light and dark portions. While there are hairs, scratches, and many other minor negative flaws, the general look to the transfer is very good. Compression artifacts appear in some of the more grainy sequences, most of which are poor quality stock footage. Audio Transfer Review: A new stereo mix is present on this disc and it offers a slightly more beefed-up version of the normal mono. It's more theatrical and has better overall clarity than the mono, which feels a bit harsh. There aren't a whole lot of directional effects, but the mixing is very good; not just a 2-channel mono mix. Extras Review: Other than a trailer, there are no extra features, but the disc has a nice amount of chapter stops. While given the present state of tensions in the world, a war drama might not be the most welcome form of entertainment; this one is at least balanced and well designed. It might not be as famous as some of the great classics, but it serves the same general purpose.